Legal Paternity Testing can be setup easily with Test Me DNA. Get results typically within 3-5 business days at affordable prices. Legal DNA testing results are accredited, admissible in court and can also be used to establish benefits. All Legal DNA testing needs to be performed by an American Association of Blood Banks (AABB) accredited laboratory. Samples for this type of DNA test, will need to be collected by a non-biased authorized 3rd party DNA collector. A strict Chain of Custody procedure must be followed for all legal testing, Our labs follow this strict step-by-step procedure in order to ensure your Legal DNA Test is admissible in court if ever needed. Following these procedures will allow your results to be used as valid facts in a legal setting. Legal DNA testing requires that all samples be taken by a non-biased 3rd party collector. With thousands of facilities scattered around the nation, Test Me DNA will have a location near you. Our trained DNA case manager will work to find a time and location that best meets your needs. At the time of scheduling, all information pertaining to the individuals testing will be gathered. Your DNA case manager will try to prepare you on what to expect during the collection process. As well as answer any questions you might have. Results can be available in as little as 3-5 business days. This is after all DNA samples are collected and received at the main DNA testing lab. Once testing has completed, a DNA case manager will notify you via phone or email. The original Legal Documents will then be mailed out accordingly. Along with your notarized results, you will also be receiving the chain of custody, which includes the photos & fingerprints taken at the draw site. Our accredited labs produce the highest quality legal documents for presentation in court and other legal matters. If this is your first paternity test, we recommend that you call our paternity experts to make certain that you order the right test for your unique situation. Our customer service reps can help answer all your paternity test questions and easily setup a test for you in just a few minutes. The process is confidential, simple, and friendly. Are appointments needed for Legal Paternity Tests? Yes, scheduling is required for Legal DNA Testing. Paperwork and scheduling must be performed before testing. Same day testing is available Monday through Friday. Is a Legal DNA Test different than a Home Paternity Test? 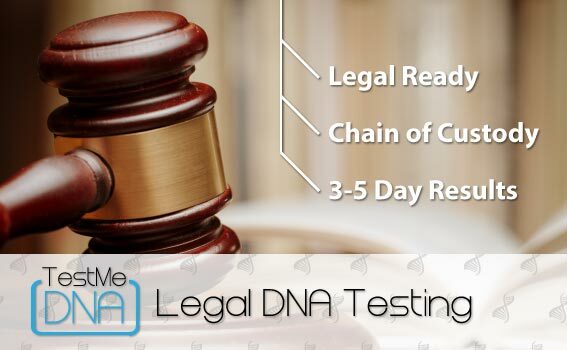 Legal DNA testing has a strict chain of custody that is followed and samples have to be collected by a trained professional. You will also get legal court admissible DNA results that are notarized. The results for legal testing can be used in a court of law and for various other reasons. Test Me DNA’s legal DNA testing and home DNA testing hold the same level of accuracy. Can people testing live in different cities or states? Absolutely. We have a network of nationwide labs that we work with for DNA collections. So Test Me DNA can schedule and coordinate testing in different geographic areas easily. There is no extra charge for parties to be tested in different locations. The collection of DNA sample is performed by an independent third-party professional. They verify that all parties testing bring in legally valid forms of ID. A photo is also recorded of all people participating in the testing. The technician collection the sample and the laboratory performing the testing must also follow a strict chain of custody and be accredited by the AABB (American Association of Blood Banks. 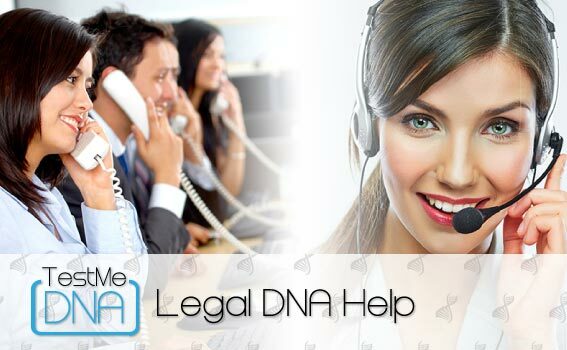 What can I use Legal DNA paternity results for? Common reasons for Legal Paternity Testing include: child custody, child support, name change, tax forms, adoption, will and estate planning, birth certificate changes, military benefits, social security benefits, tribal enrollment, court hearings, etc. With over 2000 DNA testing locations, we are sure to have a location nearby. Scheduling a DNA collection is always as simple as a telephone call. Our DNA case managers make you our number 1 priority! We care about your concerns and listen to what you have to say. We want to answer each and every one of your questions and set you up with the DNA test that fits your needs. Test Me DNA offers DNA Testing at a low cost while still offering accurate and accredited laboratory results. Most other DNA testing companies tack on hidden fees, but Test Me DNA wants to be upfront with pricing and let you know the full cost for the entire process. So from the collection of the samples to the Legal DNA testing results, it is all included in our testing price. Results for DNA testing are typically available in as little as 3-5 business days after samples are collected and received by the main lab. Results can sometimes be back in a shorter period of time, depending on the work load at the testing lab. Test Me DNA only offers DNA testing provided by Labcorp. Labcorp is the nation’s #1 DNA testing laboratory. Our contract with Labcorp allows us to offer their same great test at a discounted rate to our clients. They provide the highest level of accuracy of 99.9%. Patient privacy is of the upmost importance to us. Test Me DNA and their testing laboratory are the only companies with access to personal information. We do not share or sell your personal information with 3rd party companies.